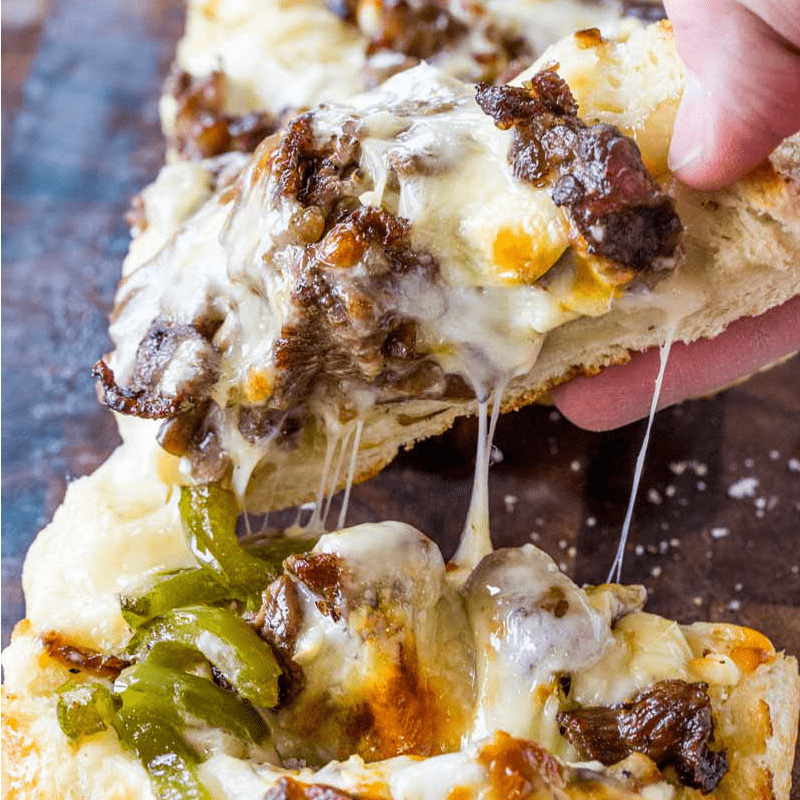 Philly Cheese Steak Cheesy Bread sounds like a hard recipe but it’s actually ready to go in the oven in less than 20 minutes and is a perfect recipe for a crowd. 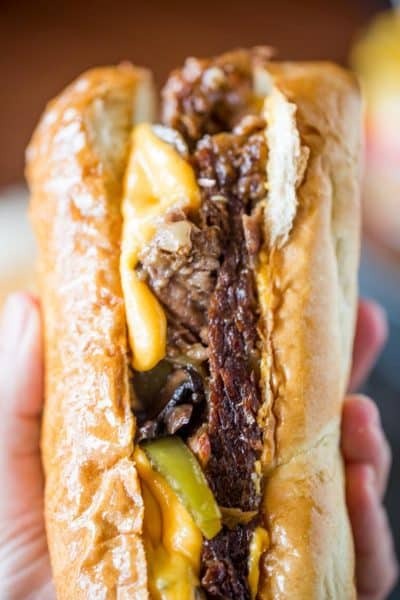 Hey everyone it’s Sabrina again from Dinner, then Dessert and this month I’m bringing one of my favorite flavors to Alyssa’s blog… Philly Cheese Steaks! 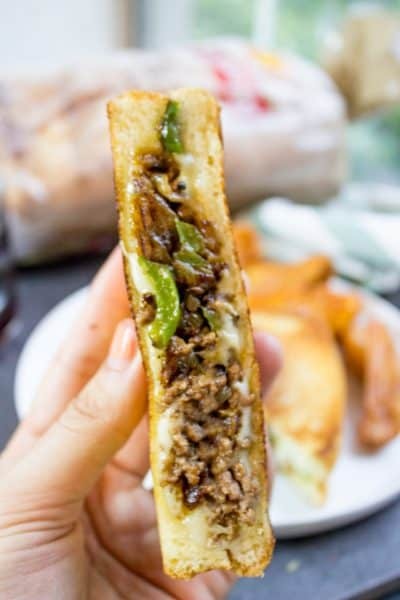 One of the most popular recipes on my blog is for a Philly Cheese Steak Grilled Cheese, and there are at least four different recipes on the blog for cheese steaks, but this one is my favorite version for a crowd. In addition to being an easy and quick dish you can serve a large number of people. In addition that you don’t even need a large amount of ingredients so this dish is actually also inexpensive to make. 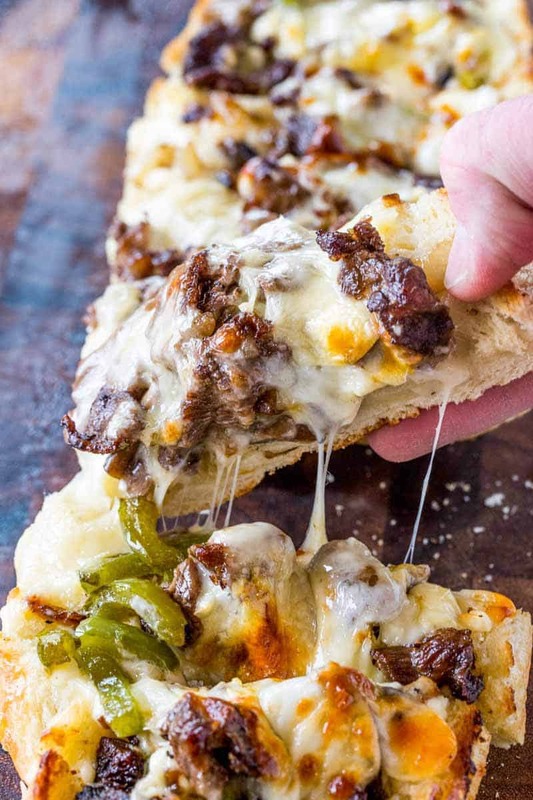 The recipe calls for Provolone, but you can use any cheese you prefer. 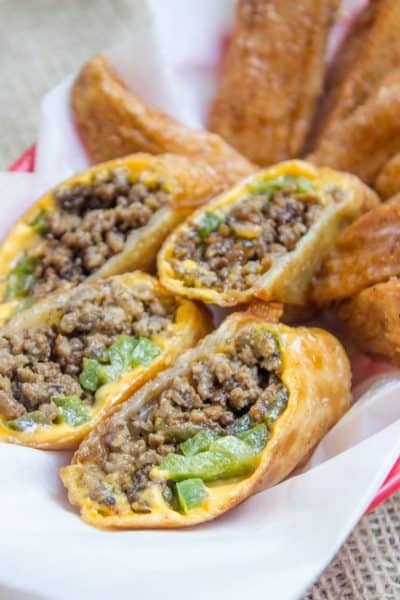 Just don’t use Cheez Whiz in this recipe, it won’t cook as well on high heat. The more tender the cut of meat the better your end product will be. I use Ribeye, skirt steak would also work really well. Just avoid really tough cuts of meat or you’ll end up with very chewy pieces of meat. The mayonnaise on the bread adds a lot of flavor and helps the end product stay moist and creamy, I would not skip it. Add the salt and pepper to the ribeye steak. Heat the canola oil on high heat in a cast iron skillet. Add the steak to the skillet and cook for 2 minutes or until the meat has a good sear (don't flip). Add the Worcestershire sauce and toss with the meat. Remove from the pan, add the butter, bell peppers, onion and mushroom to the pan. Cook for two minutes, stirring occasionally. Spread mayonnaise over both halves of the bread. Layer with slices of Provolone cheese. Cook for 10-15 minutes on the middle rack until browned. Slice into two inch thick slices and serve immediately. 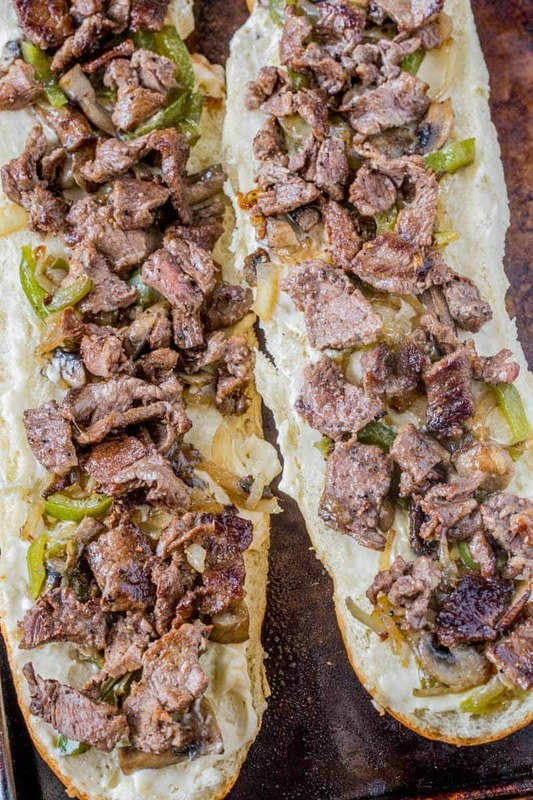 Looking for more Philly Cheese Steak recipes? SO good and SO easy for you to make! I hope you enjoy it like we did! What would you suggest to use to substitute for the mayo? 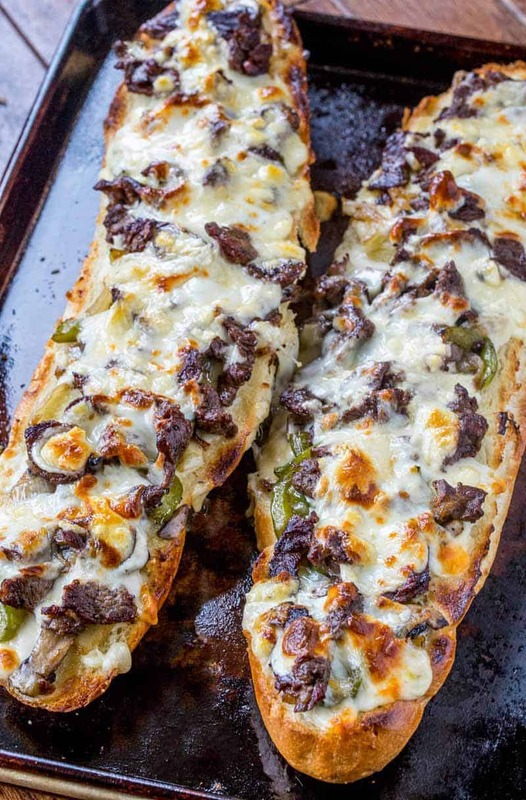 The Philly cheese steak bread was fantastic! I could only eat one slice it was a little rich for me , but I loved it! could this be frozen as is or if you don’t add mayo? I love this recipe and make it all the time! I even use chicken sometimes! Thanks for the recipe! This recipe TOTALLY works!!! Easy too. I made it for myself, so the yield will last me for awhile as I ended up freezing the other bread half. 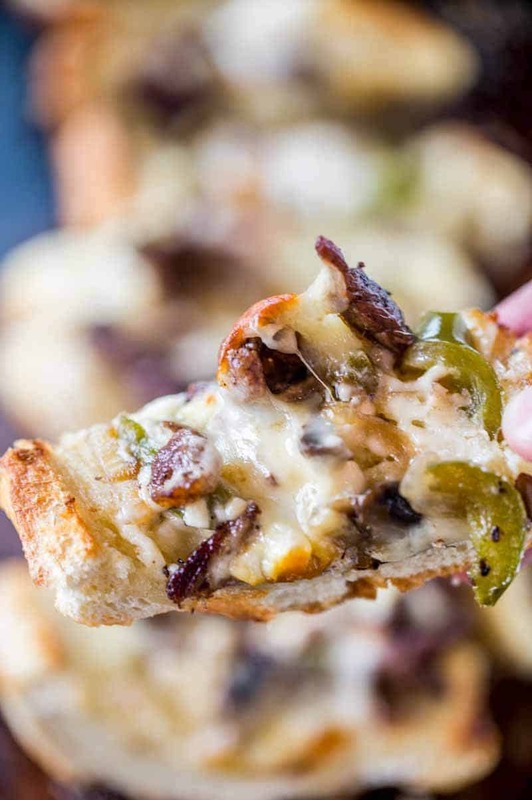 My only recommendation is to keep the oven time around 10 minutes unless you really love a super crispy French loaf and a bit of a char on the melted cheese on top…then go 13 to 15 minutes. Using a Ribeye steak…freezing it a little….then using an electric knife to get wafer thin steak slices was key to how easy it was to saute in the cast iron pan per the recipe directions. 8 oz didn’t seem like a lot until I mixed it in with all those veggies. It was plenty.